Podere Ampella offers the discerning buyer both a great investment opportunity and the chance to live the relaxed Tuscan lifestyle in the idyllic setting of this unique hilltop Borgo. Podere Ampella is centred in the most sought after location in Tuscany: The ease of access to some of the world's most famous towns and cities, steeped in art, history and culture and the stunning beauty of the renowned Val d'Orcia landscape makes for a truly outstanding home. The exclusive Podere Ampella development offers a limited number of select two or three bedroom villas and town houses designed by the prestigious Florence based architects Romanelli-Orlandini-Lotito. The Borgo has been meticulously reconstructed by skilled artisans to the highest of specifications employing the traditional Tuscan materials of stone, terracotta and wood. The beautiful interiors combine traditional architecture with stylish contemporary living surrounded by private gardens and pergolas, courtyards and swimming pools. This highly sought after luxurious development debuted in early Spring 2008 with the presentation of the prestigious Villa San Giovanni where you can experience at first hand the design, quality and location. The village has been rebuilt with typical Sienese building materials. The external walls are in natural stone or weathered and this will give you the impression of being in a typical Tuscan farmhouse but surrounded with every modern convenience. Terracotta floors and timber beams complete the rustic feel of the property. The interior fixtures and fittings are of excellent quality. Located in Val d'Orcia, only 20 km from Siena, and surrounded by the Tuscan hills , rich with vineyards and olive trees, Ampella evokes rural life that once was. The hamlet consists of three main buildings, 11 units connected by a communal courtyard. Each property consists of a farmhouse and outbuilding, with a private courtyard. The hamlet is about 2 km from San Giovanni D'Asso which is a lovely village famous for truffles and it's olive oil. Siena is about 25 km and Rome 125km by car. The nearest beach is Castiglione Della Pescaia, about 1.5 hours drive. Florence Airport is 1.5 hours drive. 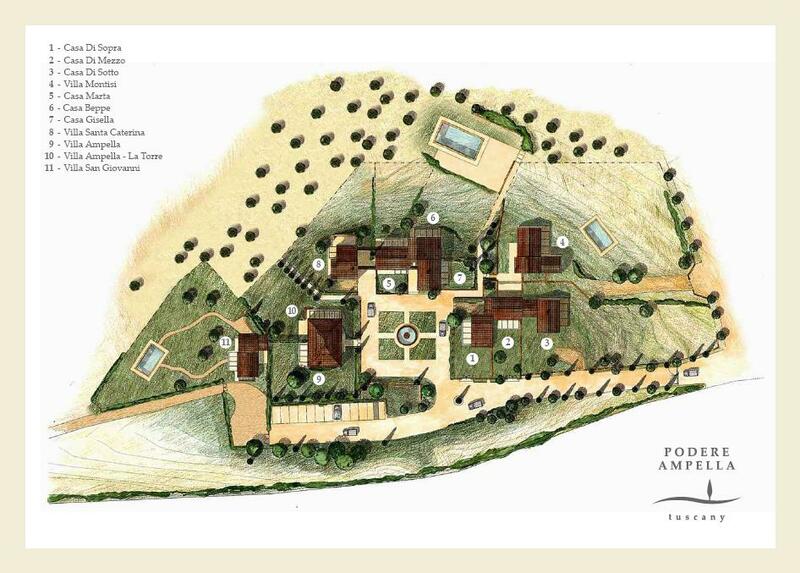 Perfectly located within the heart of Tuscany Podere Ampella is ideally situated for exploring this magnificent region. Yes. The best way is to let the developers manage it - they have an existing business renting out these villas and you can generate income whilst still having access for several weeks per year. What kind of rental income can I achieve? The developer's package meansthey take 50% of the rentals but provide a complete full turnkey management package. Typically a 2 bed house generates 20,000 Euros per annum so this covers all costs and leaves the owner with a small return. What are the communal charges? Communal charges vary - generally 3,000 Euros per 2 bed house per annum. However if you opt for the rental option, this is included in the package. Condition No work required. All properties are now completed and ready to move into.